Panzica Construction puts safety first every day on every job, but each year in May we participate in OSHA’s Safety Week. This year’s National “Safety Stand Down” was held on May 9th at the One University Circle job site. The Safety Stand Down is a voluntary event for construction employers to talk directly to employees about safety. Focused on fall hazards and reinforcing the importance of fall prevention, it gave us the opportunity to have a conversation with employees and subcontractors about hazards, protective methods, and Panzica’s safety policies and goals. 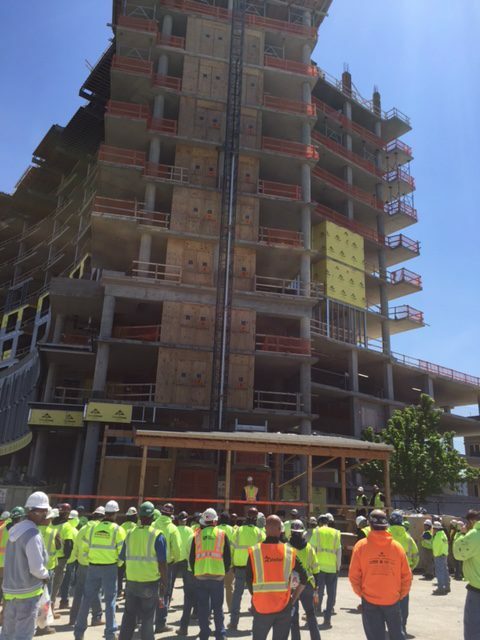 Panzica’s Safety Director Dave Valentine, Executive Vice President Mark Panzica and Adam Fries from OSHA’s Cleveland office addressed 148 employees working at One University Circle, the 20-story apartment complex going up in Cleveland. Panzica is proud to be a part of this nationally coordinated effort to spotlight safety on construction sites.